Apple is a capricious master. The products that it makes have some of the best industrial design in the world and the best build quality, but sometimes it decides to do something that you really disagree with. For me, this was the change with the iOS 4.2 update for iPad which disabled 6 months plus of muscle memory and turned a simple button slide into a double click, swipe left, tap, swipe and tap operation. Those of you with iPads will know that I'm talking of the changing of the orientation lock switch into a mute switch. The accelerometer in the iPad is sensitive to the device's orientation and it will rotate the screen to face what it thinks is the way you are using it. Great normally, but try using the iPad in bed or with the device and an angle and the orientation changing can get really annoying. The lock switch does what it says on the tin, allowing you to choose when this happens. It really annoyed me and spoiled some of my pleasure as a user. So I – and many others – let them know through their own feedback forms and online forums. Fortunately, they seem to have agreed with the concern (or decided that it was an easy PR win to try and cooperate), and iOS 4.3 brings the option to use the switch for either function. A small niggle is removed and the pleasure of using the device is raised. Dom is a happy boy. 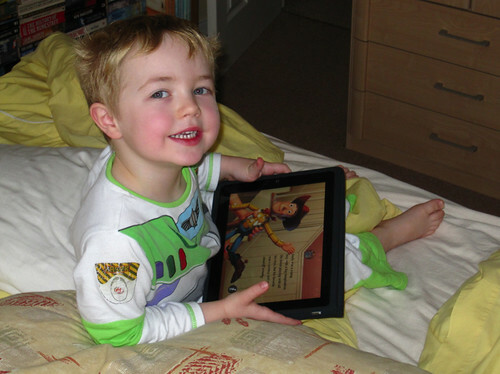 Whilst I’m a happy boy about the lock, Nathan is happier about the Toy Story app. All would be rosy in the world of interface, except for the fact that the new version of iPhoto (or at least the last one) that I upgraded to in the App Store is now providing a similar issue with muscle memory. The 'ESC' key no longer excites up a menu level when browsing photos and events, something that it has always done until the latest version. Perhaps it's time for a new campaign?